LONDON — Paul Pogba's calm nerves and David De Gea's quick reflexes kept Manchester United in the hunt for a top-four finish in the Premier League on Saturday. Pogba scored two penalties to give United a 2-1 victory over West Ham at Old Trafford, the second coming shortly after De Gea had denied West Ham a potential winner by palming away a header from Michail Antonio with a superb one-handed save. It was a much-needed win for United, but it wasn't a convincing performance as the hosts were outplayed for large spells and benefited from two disputed refereeing decisions. West Ham had a goal disallowed for offside in the first half before the hosts were awarded a soft penalty as Robert Snodgrass was judged to have fouled Juan Mata when the two collided in the area. "We got away with it, to put it that way," United manager Ole Gunnar Solskjaer said. "They deserved to get their goals. But then, it's allowed to have a good goalkeeper, isn't it?" The win ended a run of four losses in five games in all competitions for United and kept Solskjaer's team two points behind fourth-placed Chelsea. Tottenham remained three points ahead of United in third place by beating already relegated Huddersfield 4-0, with Lucas Moura scoring a hat trick. 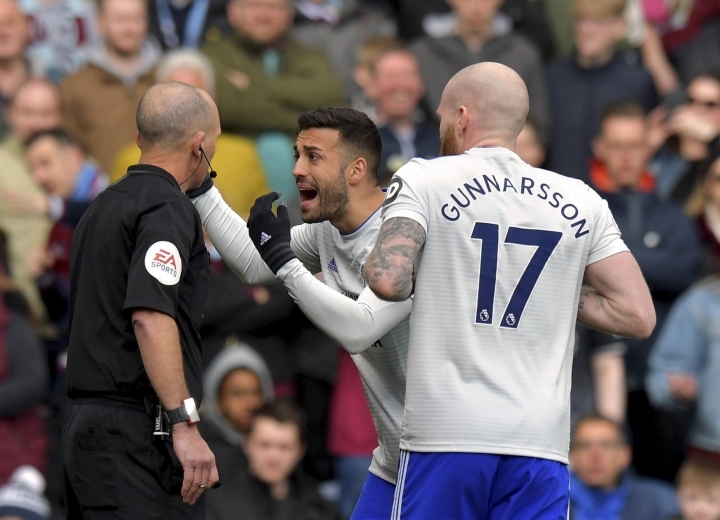 At the other end of the table, Burnley and Southampton took big steps toward avoiding relegation with crucial victories, while Cardiff inched closer to the drop after a third straight loss. 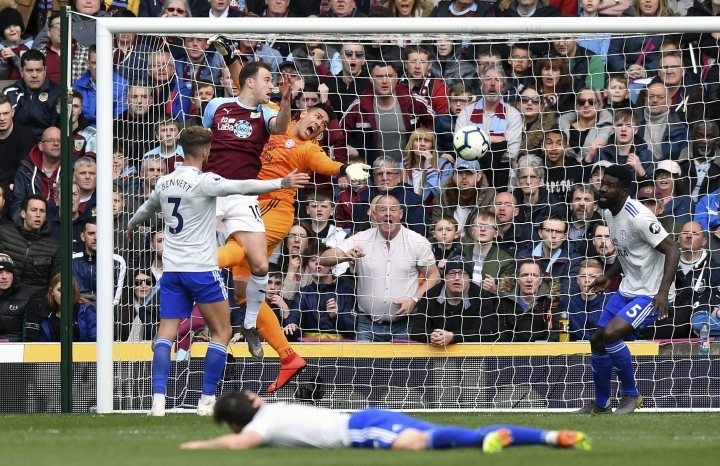 Chris Wood may well have secured another season in the top flight for Burnley by scoring both goals in a 2-0 home win over Cardiff, a result that leaves the Welsh club five points from safety in 18th place. Burnley now looks safe on 39 points, 11 ahead of Cardiff, while Southampton boosted its chances of staying up by beating Wolverhampton Wanderers 3-1. Brighton, though, is still in trouble after being hammered 5-0 at home by Bournemouth to drop to 17th place. Fulham, which has also been relegated with Huddersfield, earned its first win since January by beating Everton 2-0. With title-chasers Manchester City and Liverpool both playing on Sunday, the focus switched to the fight to avoid the last relegation spot. That now looks like a two-way fight between Cardiff and Brighton, who meet on Tuesday in a game that could decide which team stays up. Cardiff manager Neil Warnock once again had reason to feel aggrieved with a refereeing decision as Mike Dean overturned a call by his linesman to award the visitors a penalty for handball early in the second half, with the score still 1-0. That came two weeks after Cardiff was denied a penalty when leading 1-0 against Chelsea, which then equalized from a clear offside position before scoring a late winner. "Can I say I'm lost for words?" Warnock told the BBC when asked about the overturned penalty. "Once we get over the disappointment we have to get ready for Tuesday." Brighton had nobody to blame, however, after falling to its heaviest home loss in the Premier League. After Dan Gosling opened the scoring in the first half, Ryan Fraser, David Brooks, Callum Wilson and Junior Stanislas all added goals after the break as the visitors ended a recent slump in style. For Brighton, though, the problems are mounting after losing in the FA Cup semifinals last weekend. Chris Hughton's side has not scored in its last four matches, and another loss on Tuesday would leave the team just two points ahead of Cardiff. Moura made sure Tottenham didn't miss injured striker Harry Kane as the Brazilian winger became the first player to score a hat trick in the club's new stadium after Victor Wanyama opened the scoring in the 24th minute. Moura scored the second goal just three minutes later and then added two late strikes as last-placed Huddersfield limped toward its 26th loss in 34 league games this season. 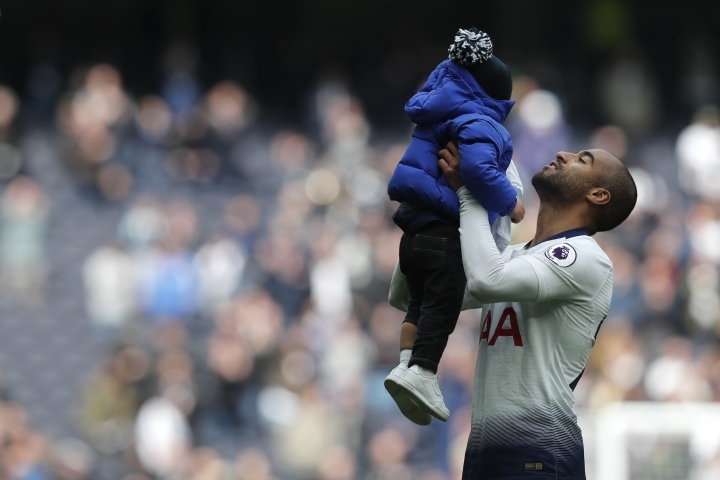 Moura celebrated after the final whistle by bringing his 1-year-old son onto the field, with the crowd cheering every time the toddler kicked the ball toward his father. 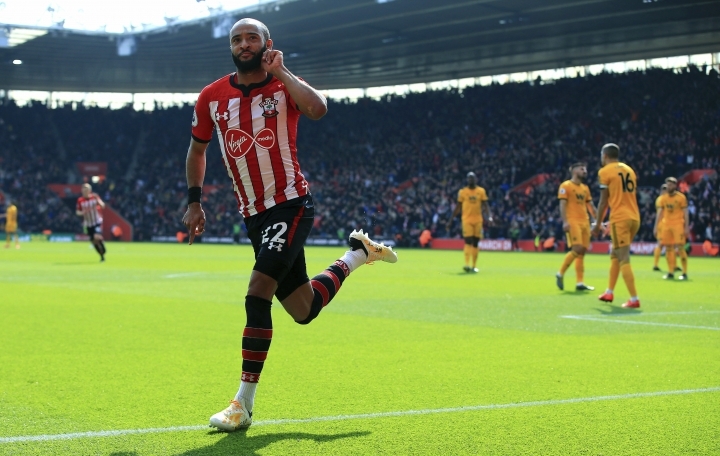 Nathan Redmond scored twice to put Southampton on the brink of safety with a key win against Wolves. Redmond put his team ahead in the second minute and then restored the hosts' lead in the 30th, just two minutes after Willy Boly had equalized for Wolves. Shane Long added a third for the Saints, which moved eight points clear of Cardiff. Fulham finally managed to keep its first clean sheet of 2019 to give caretaker boss Scott Parker his first victory in charge. Captain Tom Cairney and Ryan Babel scored for the hosts to end Everton's three-match unbeaten run.